Just about anyone who has eaten fresh roasted green chilies can attest to the intense sinus clearing effect and the overall sensation that it creates when you are eating it, but lesser known are the green chile nutritional facts and health benefits. Green Chile is a “super food” with super benefits like low cholesterol and rich in vitamins and essential minerals that make this the perfect part of your regular diet. Green chilies are rich in vitamins A and C with the dried version higher in vitamin A and the fresh version higher in vitamin C. They can contain as much as six times the amount of vitamin C as a single orange. Their vibrant color signasl high amounts of the antioxidant beta-carotene, which supports the cardiovascular system, as well as helps maintain the health of the skin, eyes and immune system. Green chilies also contain vitamins B and E, and are a good source of iron and potassium. Green chilies do not contain fat or cholesterol and help block the body's absorption of cholesterol while remaining low in calories. Green chiles can increase your metabolism because they contain capsaicin. 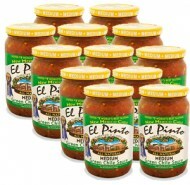 This component gives Green Chiles their "hot" taste. When a person eats this hot food, the body reacts by raising the thermogenic process which increases your metabolic rate. The hotness of chile peppers causes the release of endorphins, the neurotransmitters in the body that reduce pain and induce euphoria. When there is a certain degree of hotness in a dish, it makes the taste more pleasing and more enjoyable. In order to retain all of these rich vitamins, nutrients and health benefits in our salsas and sauce, we hand peel all of our green chiles using the time tested traditional method of fire roasting the chile, sweating it to soften the skin, and then hand pealing. 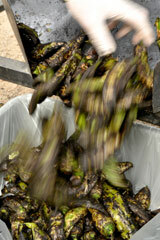 Only flame-roasted hand-peeled green chiles can provide the nutritional rewards you expect.